I would consider myself a lover of all things “French”, but I have to say that I am a fan of many things “English” as well. My husband and I have been hooked from the beginning with a series called “Downton Abbey”. This coming January 2015 will be season 5 and we are anxiously anticipating its start. I mention this BBC series because watching it made me think of cookies (naturally! ), as lovely afternoon tea was being served on some episodes and it got me to thinking about what is authentically English when it comes to baking. Well, of course, that would be “tea cookies’ right? This fall I will be introducing and adding to my menu offerings three (3) very special English Tea Cookies: Earl Grey, Chai Spice, and Chamomile Lemon. 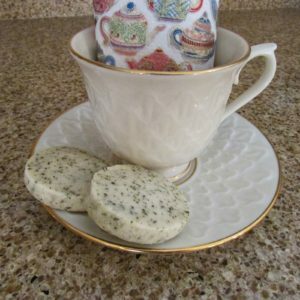 Each cookie has natural tea leaves sprinkled throughout the dough, giving it a subtle but recognizable hint of the cookie flavor, without being cloying. The Earl Grey has a light bergamot (orange) flavor, Chamomile Lemon has a light lemon flavor, and the Chai Spice has a variety of spices including cinnamon, allspice, clove, and cardamom. The cookies have a nice “snap” to them when biting into them, but not much chewing is necessary, as the cookie will melt in your mouth. Sold by the dozen, you may mix and match flavors as you please. These are great with your cup of tea (or coffee for that matter!) and make a nice afternoon snack or hostess gift. Enjoy trying all the flavors!